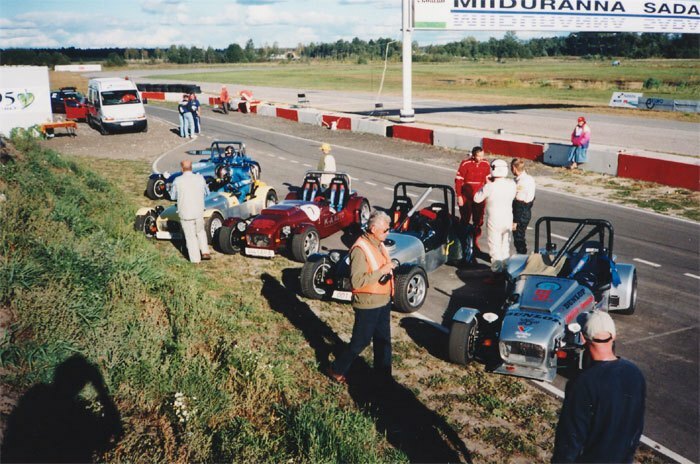 All ESTfield owners are invited to take part in the season's most important international race meeting on the Pärnu Sauga circuit on the 24th and 25th of September 2005. Our cooperation partners in Sweden are also considering taking part with their ESTfields and a Ford GT40. The last race is a handicap race where the winner may be the driver of the least powerful car. Prizes for all participants! The final party is at the Villa Antropov, a former high-society residence. A lottery for a prize worth 100 Euros will be held between the guests. 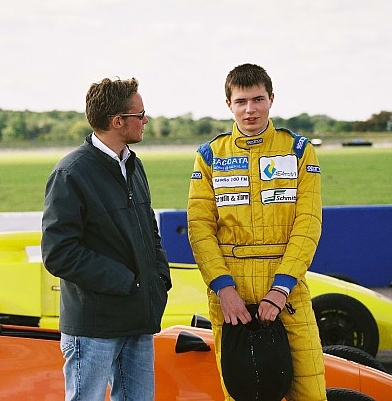 24 September 2004 Our kart racing team member Dmitri Janis takes the next step and participates in the one day intensive racing drivers course at Silverstone UK, where he gets the chance to try out the Formula First, Lotus Elise, Westfield and Audi A4 skid control car. Saturday - 2 training sessions and demonstration race. at Pärnu. All ESTfield owners/ racers/ enthusiasts welcome. 19 July ESTfeld owners' meeting in Pärnu. Results and pictures. 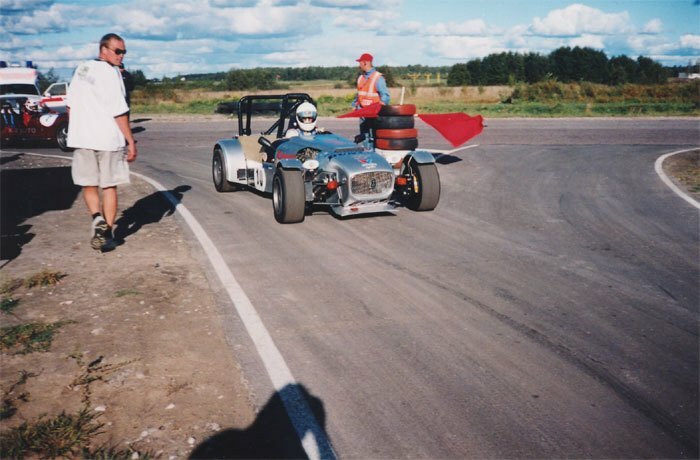 22 September "Everyman's Rally Sprint" on the Rapla kart circuit. 14 Septenber Motul Night Race at Raadi Airfield, Tartu. 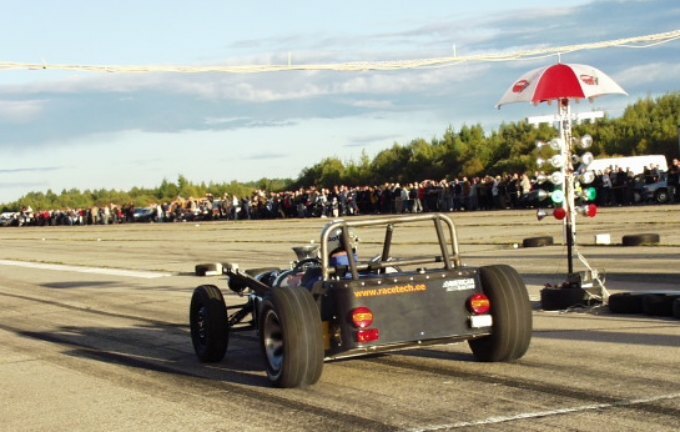 12-15 September ESTfield Club meeting and practice and race days in Pärnu. Click here for race programme. 23 August ESTfield owners training session on the long circuit at Pärnu. 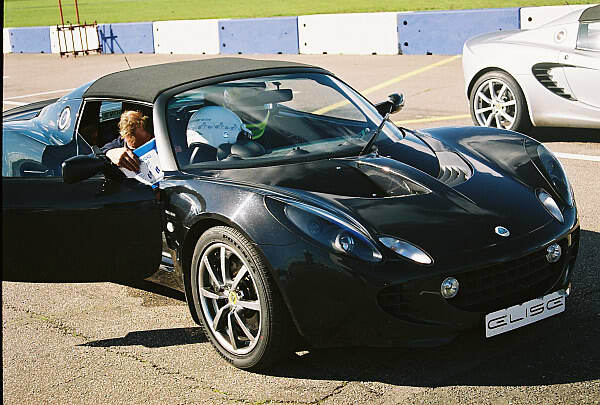 14th August Pärnu circuit training day and the first ESTfield owners meeting this year. 10. August RaceTech's 1.6 litre Lada powered ESTfield 1st in the 2 litre class at the Raadi Drag Race. 11-12 May The "Raadi Speed" drag race on Raadi airfield. 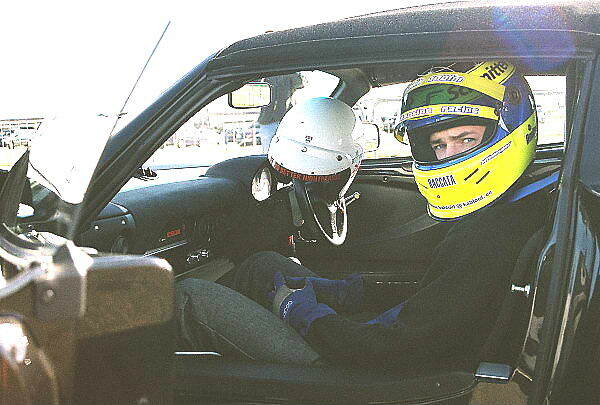 09 August 2003 - Baltic Sea Racing Cup 2003, Round 2, Class- Estfield. 19 July ESTfield owners' meeting on the Pärnu circuit. 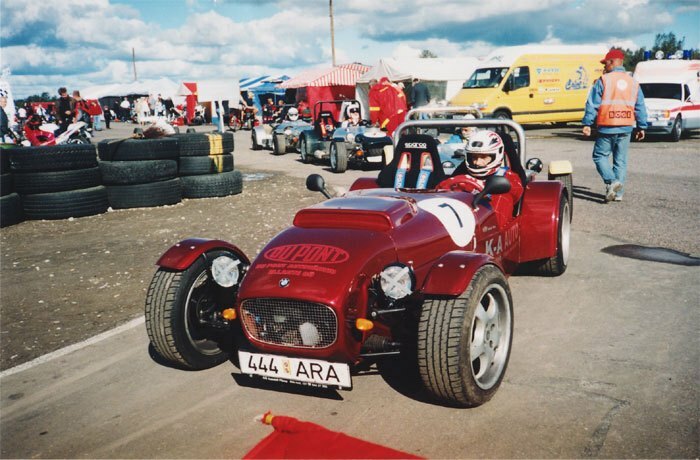 Our aim was to record the the first official times for our V8 ESTfield in its street-legal (not the silencer) set-up. The car had a non limited-slip volvo 240 differential (3.9 ratio) and General XP2000 275/60/15 tyres, which we intend to use on the road. Unfortunately we only managed 4 starts and we were not satisfied with our best 1/4 mile time of 13,191 seconds. As we suspected the non-limited-slip differential coupled to road tyres did not allow us to translate even a small fraction of the engine's power into forward motion. Nevertheless our objective was fulfilled and we now have a starting point from which to go on. We are still hoping to find a higher ratio LSD, and we already have drag racing slicks waiting for us in Sweden. Perhaps someone knows where we may find a LSD for the Volvo 240 rear axle? Despite some small hitches the whole event was well organised by Meelis Pärtelpoeg and his team - so a big thanks to them. 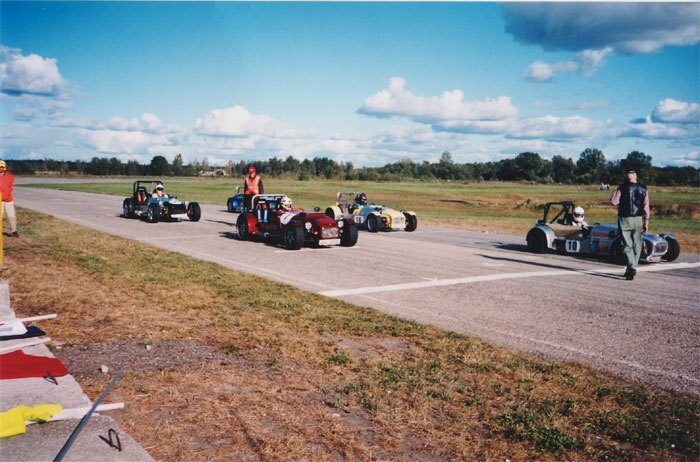 Since we also raced in Pärnu that day in the "Pärnu Sügis 2002" event where Indrek brought home a clear victory in the ESTfield class (10 seconds per lap faster than the next car), we arrived at Raadi for the last timed runs and there wasn't much time to set up the car afterwards. The 13.865 seconds we achieved was disappointing and fell short of our 13.560 record. The head to head finals however offered some solace since we achieved a clear victory in the 2 litre class, which gives us encouragement to continue with a 1.6 litre engine next season. Our result in the timed runs placed us third in the upto 3 litre class but after a false start and restart Indrek's result in the third heat of the head to head race was disallowed which left us in 4th place overall in that class. It would have been a lot to ask to want any more - two firsts in two different races in one day is a testimony to the ESTfield's excellent winning potential and sets a hard example for others to follow. All in all it has been a very successful 2002 racing season. 6 ESTfields turned out for the race, 5 raced and one (V8 ESTfield) was unable to start due to engine problems. Cars Nos. 1 and 7 were on road tyres while the other cars were on slicks. 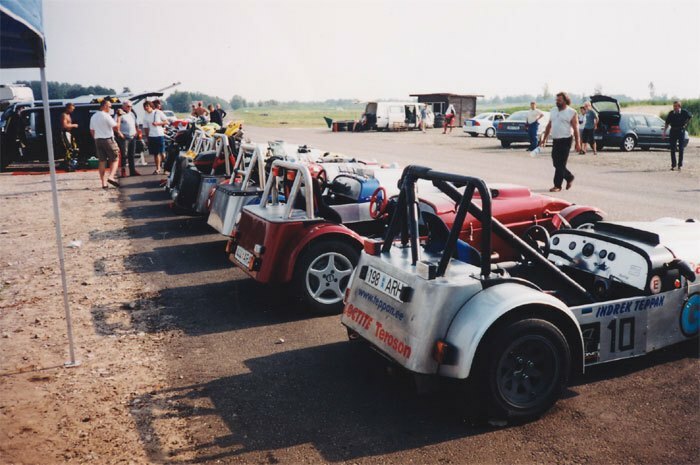 In the very first ESTfield race the grid line-up was as follows: 10, 7, 8, 1, 17. The race distance was 10 laps. As the green light was given, Indrek, Urmas and Tõnis made a good start, Felix who was having problems with his clutch jumped the line too early, which didn't improve his position but did earn him 30 seconds penalty from the competition judges. Indrek took the lead clocking up a best lap time of 1:00.58 (average speed 136.68 km/h). Behind him, Urmas and Felix were battling hard for second place, producing some exciting moments for the spectators. Urmas eventually emerged as the victor- coming in second with a best lap time of 1:08.16 (average speed 121.48 km/h). Felix was third with a best lap of 1:10.53 (average speed 117.40 km/h). Fourth was Tõnis on his road tyres, achieving a lap time of 1:17.88 (average speed 106.32). Fifth was Tiit in his car, on which the mechanics had not managed to set up the front suspension before the race. However he still managed a best lap time of 1:18.27 (average speed 15.79). During the race Valter Teppan told the spectators how the ESTfield was born and gave a run-down of future racing plans. Urmas Kiviselg: "I've competed in motocross before, but this was my first experience on a circuit in a car. It was an interesting experience. The g-forces, braking, accelerating were all there - I would imagine driving an ESTfield is something like 20% of the thrill of driving an F1!" Tiit Aruvee: "I did not manage to get the cooling right - the water-temperature gauge was showing 130 degrees C while I was on the track and I was worried about the engine. So it was a struggle to reach the finishing line. Next time the car will certainly be in better shape. Nevertheless, all in all, the event was OK. My aims do not include beating someone at all costs. For me the club spirit and the good company are much more important." 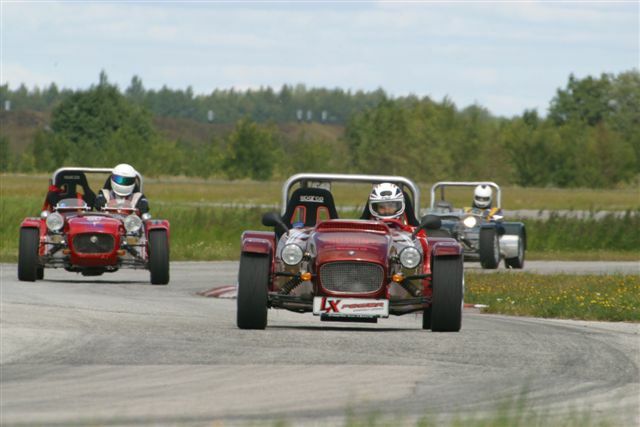 ESTfield owners training session on the long circuit at Pärnu on 23 August. 4 cars were present and 3 of them were driven on the circuit. 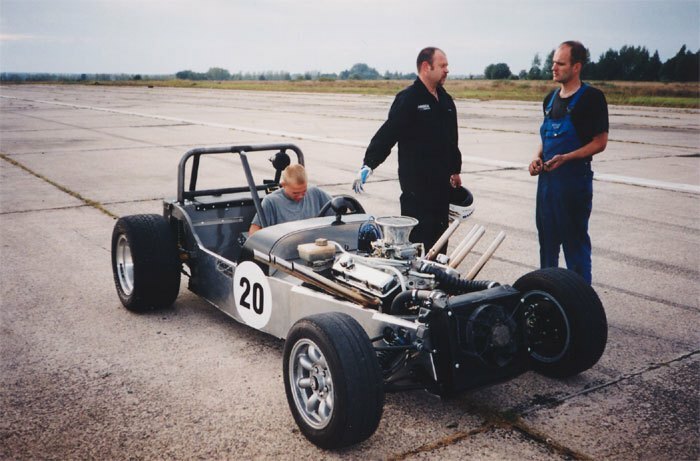 On Friday the best lap time of 1:08.71 was set by Urmas Kiviselg in his 1.8 litre BMW powered ESTfield, corresponding to an average speed of 120.51 km/h, second was Felix Paves with 1:09.09 with the 2.0 litre Alfa Romeo powered car - average speed 119.84 km/h, and third was Indrek Teppan with the Chevy V8 powered ESTfield, with a time of 1:14.10 and an average speed of 111.74 km/h. 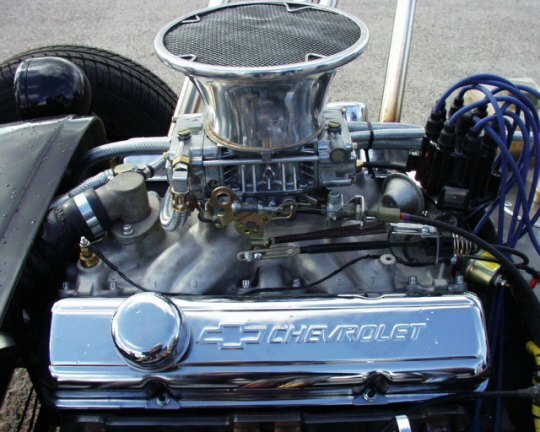 Since the ESTfield Chevy engine was still being run-in revs were kept below 4000, however, Indrek noticed that the engine wasn't pulling properly and closer inspection revealed that the 2nd cylinder pushrods were broken. Since the necessary spares could not be found in time, the car was unable to race on Saturday. 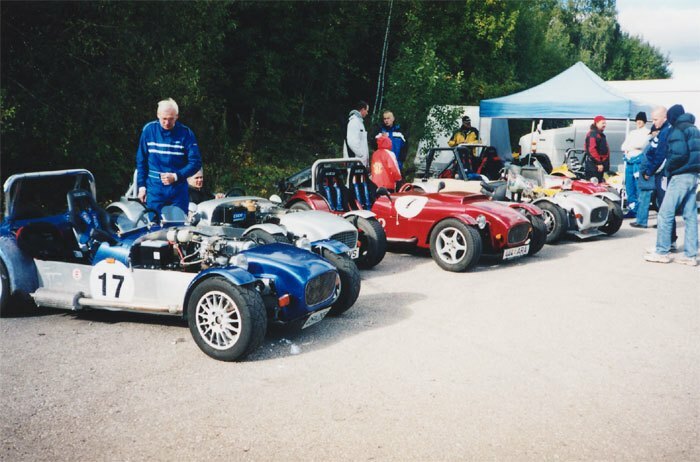 Pärnu circuit training day and the first ESTfield owners meeting in 2002. The Pärnu circuit team organised a training day for motorcycles and cars. For the first time 10 ESTfields arriving under their own power from all across Estonia attended the meeting. There was a chance to compete, set up the cars, and share know-how. In the evening everyone got together in the Aleksandri Pub to bring the test day to a close and to endorse the EHOC (ESTfield Happy Owners Club) statute. 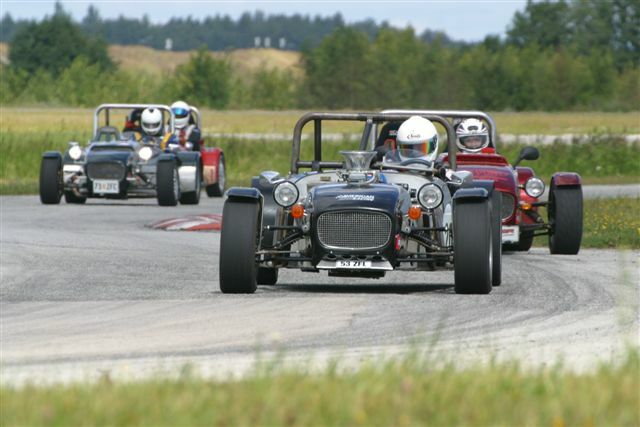 It was decided to participate on the 23rd and organise a Club race on the 24th on the Pärnu circuit. 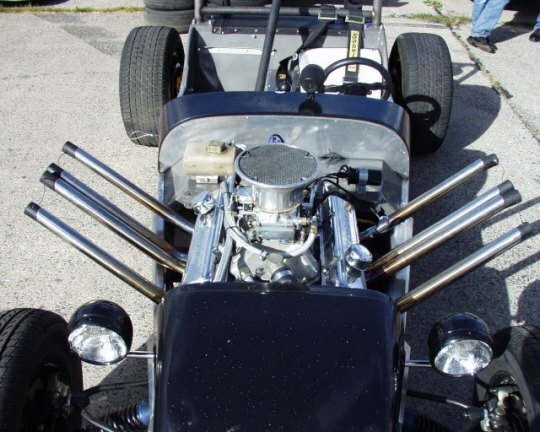 At the same time we also plan to demonstrate the circuit racing capabilities of the Chevrolet V8 powered ESTfield. Unfortunately we could not compete due to an oil leak. Despite the efforts of the team we were not able to find or solve the problem. Nevertheless the cars immense competitive potential became apparent. We still need to find proper drag tyres and a LSD. Later inspection revealed a bolt-hole drilled through the sump - we put a bolt in place and the oil problem was solved. All help and suggestions are welcome regarding the sourcing of suitable wheels and tyres and an Opel Senator LSD. The car will certainly be seen again at the next Raadi drag meeting in September. RaceTech's 1.6 litre Lada powered ESTfield 1st in the 2 litre class at the Raadi Drag Race on 10th August. Our time of 14.44 for the 1/4 mile was clearly unsatisfactory for our car, since we have achieved times a second faster (13.56). The reason lay in insufficient preparation. The car also had unsuitable wheels and tyres for the event. We will prepare better for the September race and have set ourselves a target of less than 13 seconds. The organisers of the event yet again had problems registering the ESTfield. We were "inadvertently omitted" from the 2 litre class, but were fit for the open class of over 3 litre cars. After some confusion before the final runs we were at last allowed to compete in our rightful class. 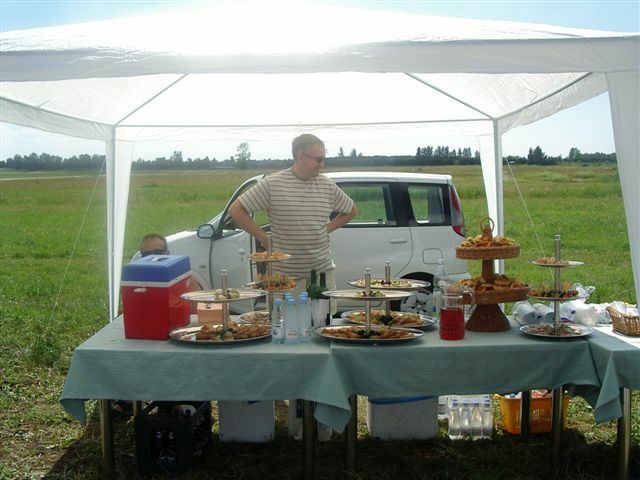 In general we were satisfied with the organisation of the event. Pärtelpoeg and Team should accept the recommendations given by the Finnish specialists concerning the organisation of the event. A big thanks to him and the team. 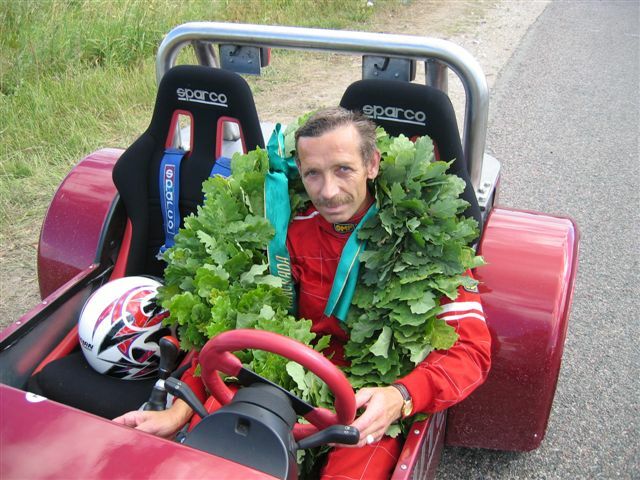 In official training on the long Pärnu circuit Indrek Teppan set a new lap record in an ESTfield - 59 seconds. 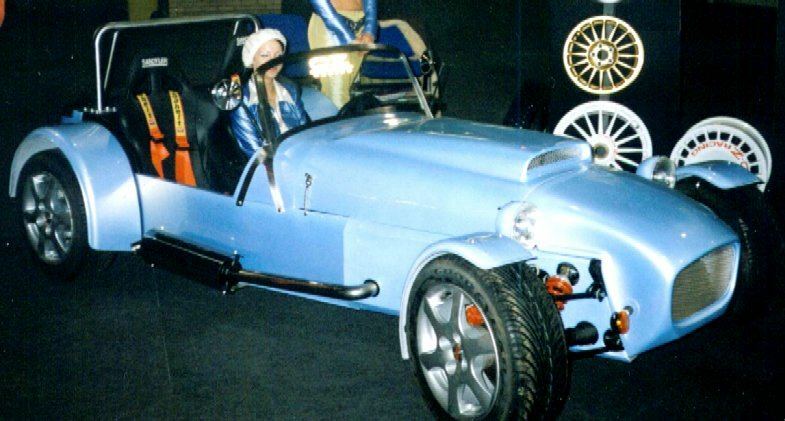 The new record was set in a Lada powered 1.6 litre ESTfield, and the average speed was 138.07 km/h. The result was recorded on the official lap timing equipment and was confirmed by the competition office. Here are some pictures of the ESTfields that turned out for the training day. The "Raadi Speed" drag race on Raadi airfield on Saturday11 and Sunday 12 May. As promised we took part, although there was no time to change the setup of the car after it had come off the Riga circuit. The organisers were not able to get their electronic time recording equipment to work, so it was decided to go ahead with flagged starts and stop watches. As was feared this created a lot of confusion and the true abilities of cars and drivers could not be satisfactorily assessed. Seeing our car in the list of entrants, panic ensued (especially in the ranks of the "fast" and flashy brigade). This culminated in our car being excluded from our class for not being registered on the road and other technicalities. 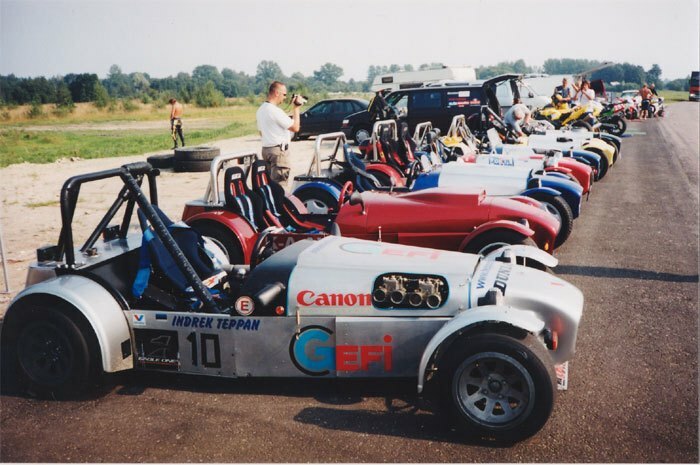 We were finally allowed to enter our 1600cc car in the so-called "open class", with cars over 3000cc !! Not withstanding that, attempts were later made to exclude our car from the head to head races too. However, we managed to stand our ground and still take part in the whole competition. Since the start was given with a flag then it was very difficult to define precisely when the start signal was given and when the cars began to move. Later the driver who stole a whole car's length in the start was not penalised, since he thought the start signal was the start of the movement of the flag not the dropping of the flag. Next time we will make sure our car complies with the unwritten rules and will compete in our own class "up to 2000cc" and maybe in some other classes if this doesn't upset anyone. In our oppinion drag racing is primarily a contest of man and machine against time, not against someones unwritten rules i.e inflated ego, empty head, and thick wallet. N.B.! We still have some surprises in store for the next competition! Wishing everyone good luck with the preparations for the next event. ESTfield - TOO Fast for racing? 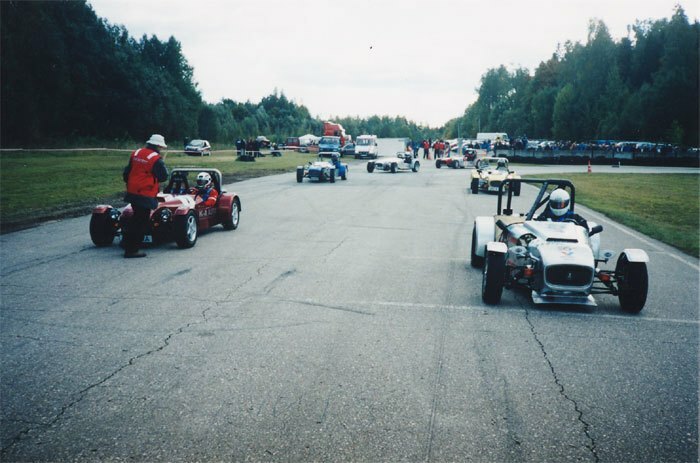 The first international race meeting in the Baltic Cup series for ESTfields took place in Riga, the capital of Latvia, on the weekend of the 4th and 5th of May 2002. 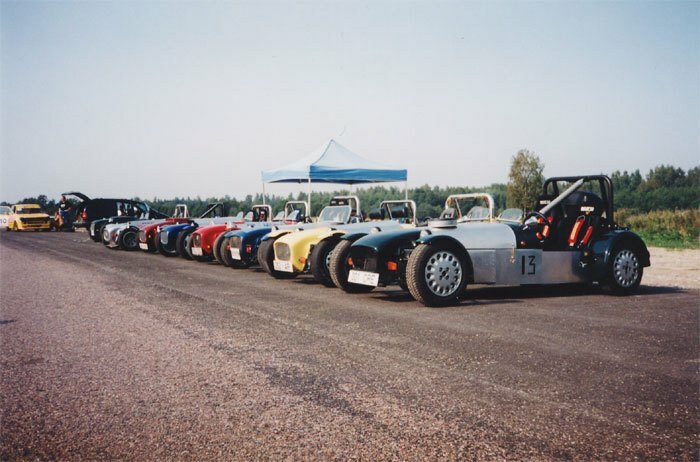 Two cars assembled in Latvia took part: chassis 012 - built into a car called LOTA, and chassis 031 assembled by the Arcers Club which was completed just the previous evening. 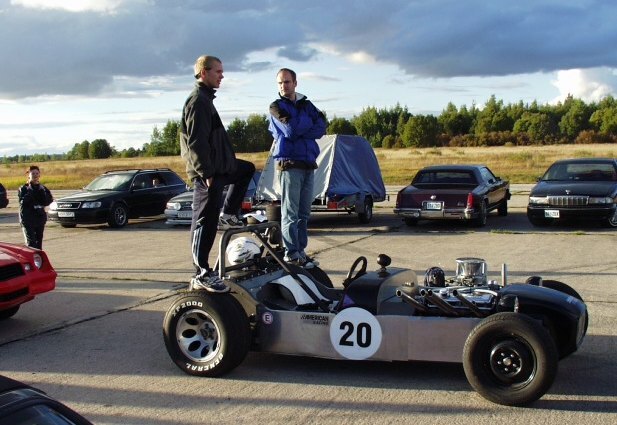 Two cars built by RaceTech in Estonia also took part: RaceTech's race prepared car A004 (chassis 010) driven by our test driver Indrek Teppan, and the Alfa Romeo powered car A003 (chassis 008), with owner Felix Paves at the wheel, driving in the STREET class. 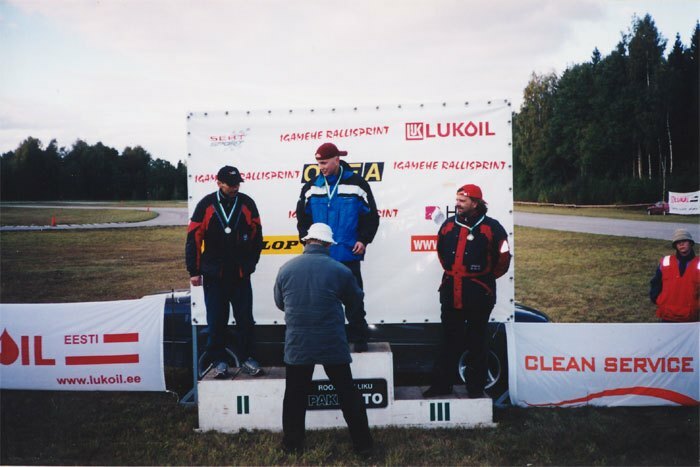 Since the Latvian participants had planned the first event as a demonstration run, no lap times were taken and no championship points were awarded at this meeting. Nevertheless the event was very much a success from the promotional aspect, with lots of interest from the public. Indrek also had an opportunity to get to know the Riga circuit. Our race car showed itself to be very fast, especially on cornering, where the new DUNLOP racing tyres, provided for testing by our sponsor Dunlop dealer Kristo Ebras, glued the car to the road. Our car was faster than some specially prepared 60 000 Euro circuit racers. 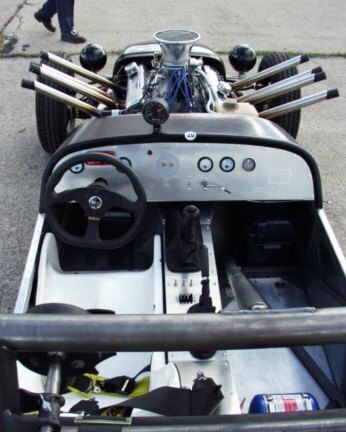 We also received valuable advice from specialists on streengthening the roll-cage mountings on the car. Felix found that he needs to give his engine a much needed rejuvination, since the unit was dropped in as-is from a high mileage donor, with no time for any overhall. The Latvians' LOTA was very fast in its class and must certainly be a championship contender. The Arcers car had only just seen the light of day and still needs a few weeks work to get it running stably and fast.